Preparation time: 12 minutes. Chilling time: 30 minutes. Lay tortilla on clean cutting board. Spread the Neufchâtel cheese thinly over the entire surface of the tortilla. Place one ounce of sliced turkey evenly over cheese. Place romaine lettuce leaf in center of tortilla. Arrange thinly sliced tomato evenly over surface. Dip avocado slices into lemon juice for a few minutes to prevent from browning. Drain on paper towel and arrange evenly over whole tortilla. Sprinkle sunflower seeds evenly over entire surface. 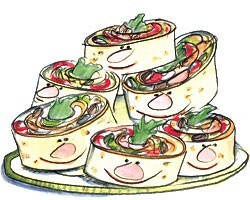 Roll up the tortilla, burrito fashion, pressing tightly while rolling the contents. Secure with toothpicks or a clean rubber band and chill for 30 minutes. Remove from refrigerator and slice crosswise into circles or, if preferred, leave whole. Wrap in plastic wrap to avoid drying out and chill until serving time. Serving size: 1 tortilla roll. Exchanges per serving: 2 starch, 2 medium-fat meat, 2 fat. Carbohydrate choices: 2.